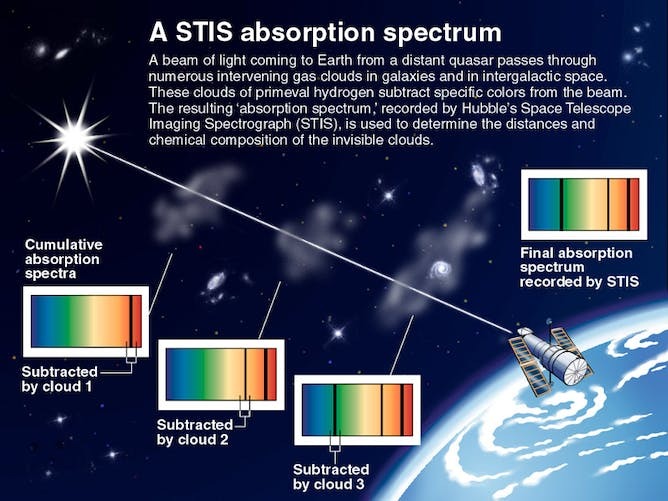 The basic story is that gas collects toward the center of roughly spherical “halos” of matter. The gas then cools, condenses, fragments and eventually collapses to form stars. Generations of stars build up the galaxy and with it the production of heavy elements – such as carbon, oxygen and so on – that populate our periodic table and comprise our familiar physical world. Astrophysicists like me have pieced together this picture thanks largely to theoretical research. We run numerical simulations on the world’s largest supercomputers to capture the processes that govern galaxy formation – gravitational collapse, heating, radiative cooling – at high fidelity. To study many of these processes, we were largely restricted to this kind of theoretical inquiry because we didn’t have the technical capacity to observe them. 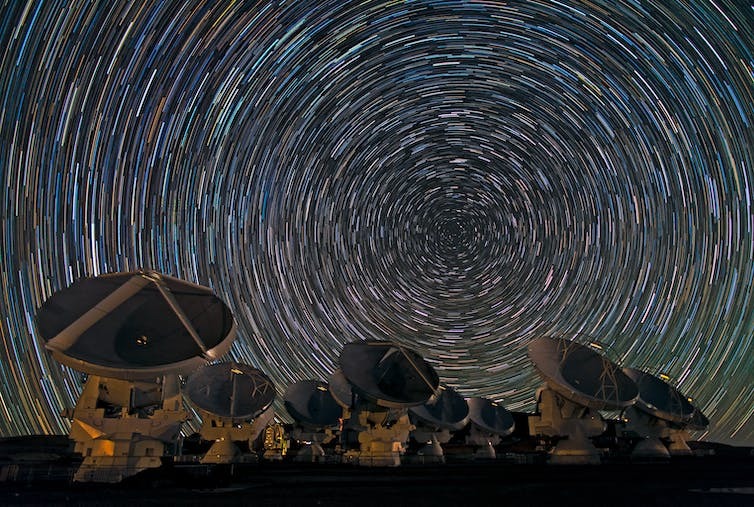 But things have changed as we’ve witnessed the rise of what we consider the “Great Observatories”: NASA’s Hubble Space Telescope, the twin 10m Keck Telescopes on Manua Kea, Hawaii, and, most recently, the Atacama Large Millimeter/submillimeter Array (ALMA) in northern Chile. 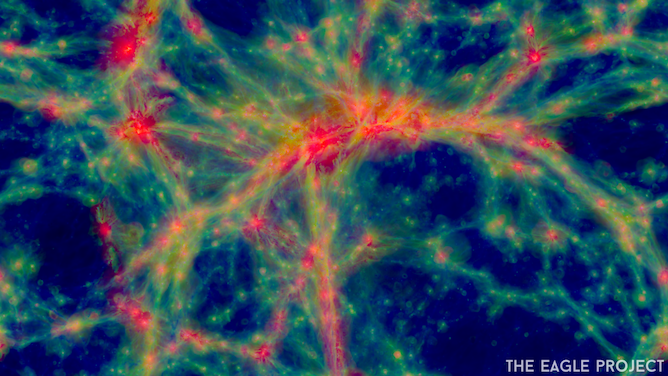 With these facilities, astronomers have sought to test and refine the tenets of galaxy formation theory, especially the processes governing galaxy assembly and star formation. The new data our group is publishing based on observations from ALMA are truly transformative relative to previous observations. They allow us to directly image the gas in nascent galaxies – something that was impossible before – and thereby test our fundamental predictions of galaxy formation. To address this challenge, starting in 1986 our group – led by the late Arthur M. Wolfe – relied on an indirect way to study distant galaxies. 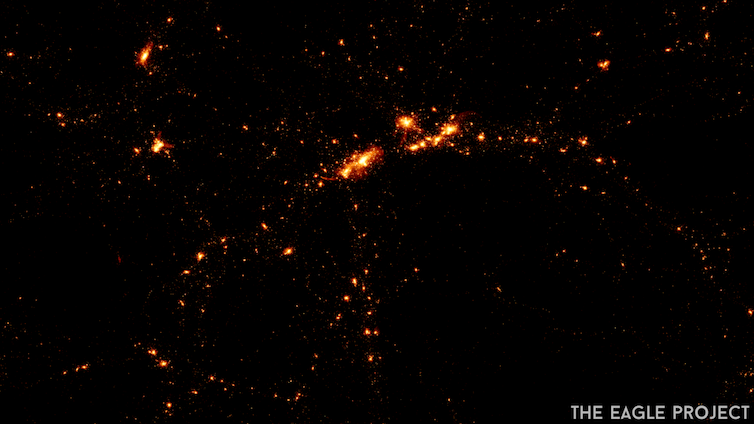 Rather than focusing on the galaxies themselves, we recorded the light from quasars that are even farther away from us. This allows us to probe gas in foreground galaxies. Arthur used spectrometers at the primary observing suite of the University of California Observatories, first instruments on the Shane 3m telescope of the Lick Observatory and then, upon being commissioned, led research on the powerful Keck telescopes. 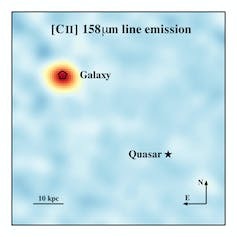 These data provide estimates on the gas surface density, heavy element enrichment, molecular content and dynamical motions of the galaxy. This observational experiment, however, is limited. It offers little information on the galaxy’s mass, size or star formation – all things that are fundamental to a galaxy’s makeup. It is critical that we measure these properties to understand the formation history of galaxies like our Milky Way. 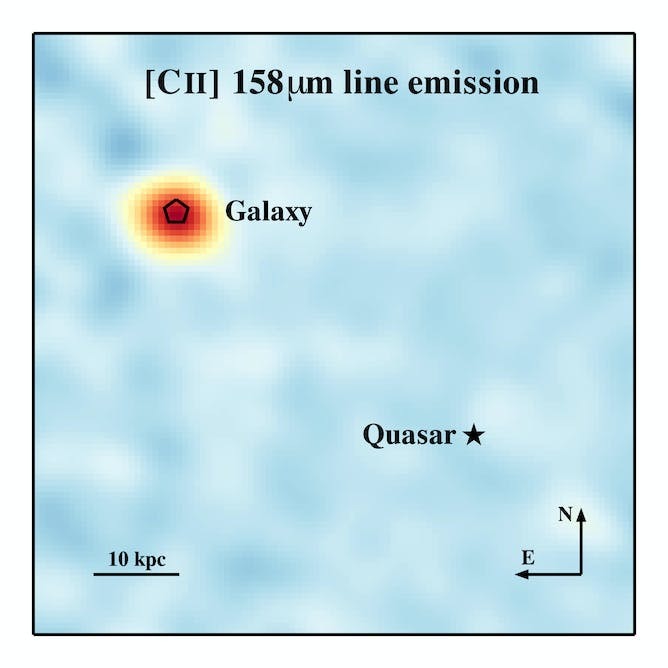 In 2003, we reported that the then-future ALMA telescope would be a true game-changer by enabling us to directly image the gas within nascent galaxies. We would have to wait over a decade to begin while the telescope was built – so we had plenty of time to carefully identify the optimal targets and refine our observing strategies. 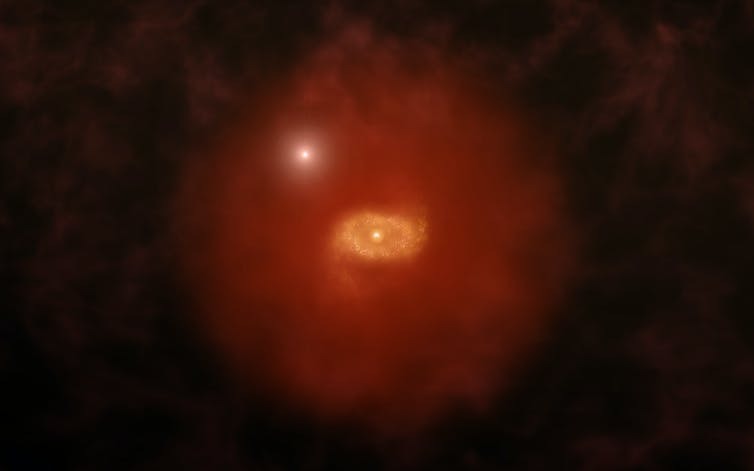 The ALMA data also uniquely resolve the internal motions of the galaxy’s gas. Our analysis of the dynamics indicates the gas is configured in a large disk – similar to our Milky Way – and rotating with a speed of approximately 120 km/s. This speed is characteristic of what theory predicts for the progenitors of this sort of galaxy. Lastly, we detected emission from “warm” dust in the galaxy. (Of course, warm is relative – in this case only about 30 degrees Celsius above absolute zero.) We believe the dust is heated by young massive stars; we estimate that the galaxy is forming stars at a rate of over 100 suns per year, a prodigious and precocious rate. These data demonstrate the power and potential of ALMA to discover and dissect the progenitors of galaxies like our own. They will be invaluable to refine our understanding – in space and time – of the build-up of galaxies. Milky Way-like galaxies in the early universe. Rude interlopers jump between the space telescope and its intergalactic targets.